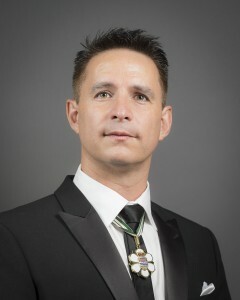 Paul Lacerte, Executive Director of the BC Association of Aboriginal Friendship Centres, has been advocating for the betterment of Aboriginal people for more than 20 years. Under his leadership, the association has grown to over 30 staff and the Aboriginal Friendship Centres in BC have grown to over 1,000 staff delivering programs and initiatives to thousands of urban Aboriginal people each year. Mr. Lacerte is a practitioner of traditional Aboriginal culture and spirituality. He has a gift for inspiring and supporting Indigenous youth. Through his leadership in the development of the Gathering Our Voices Aboriginal Youth Conference over the last 12 years, over 1,000 Aboriginal youth from BC and across Canada have come together each year to network, learn new skills, share knowledge, explore career and educational possibilities and participate in sports and recreational activities. Paul Lacerte is the personal creator of the Moose Hide Campaign which started in 2011. It is a grassroots movement of Aboriginal and non-Aboriginal men who are standing up against violence toward Aboriginal women and children. As part of the annual campaign, men wear a small patch of moose hide to symbolize their commitment to honour, respect and protect the women and children in their lives. Mr. Lacerte is a member of the Board of the Vancouver Foundation and sits as one of the Canadian representatives at the United Nations Permanent Forum for Indigenous Peoples.